U.S. Army Sgt. David Reid was “tricked” into receiving a brand new home courtesy of the Pulte Group. Reid served three tours overseas as part of the elite 75th Ranger Battalion. His service took him to Iraq once and Afghanistan twice. Unfortunately, the decorated veteran was injured during his final deployment in 2010. Reid is referring to the 11 surgeries and countless hour of physical therapy that were needed to make his leg suitable for a prosthetic leg. He quickly adjusted to his new situation without complaining or regretting the sacrifice he made to protect American freedoms. 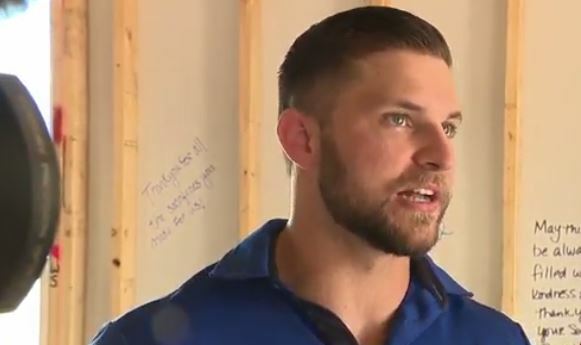 He has been rewarded for his sacrifice with a mortgage-free, brand new home, that was created and is still being built for a wounded veteran. Reid received a Purple heart, a Combat Infantry Badge, and Iraq and Afghanistan Campaign Ribbons. However, despite his accomplishments he said that one of the most rewarding experiences to come out of it were the messages that were scrawled inside the home. Dozens of messages from volunteers and contractors that built the house were written on the drywall of the home. Reid plans to give back to the community by attending medical school and one day becoming a doctor. Trump Launches Nationwide Snapchat Filter Mocking "Crooked Hillary"
Watch Marines Sing Tribute Song: "Here Without Harambe"